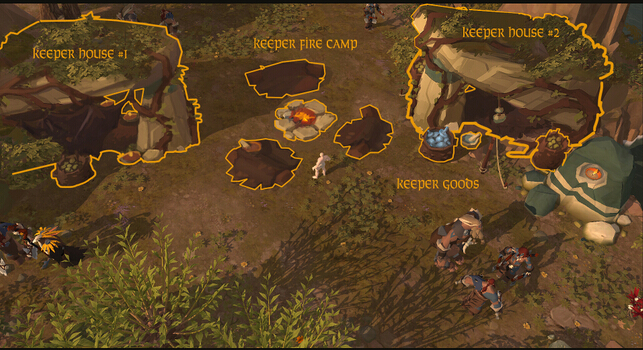 as you probably are aware, we're currently focussing on the preparations for our Closed Beta. If you haven't seen our roadmap yet, you should check it out here. In addition to those bullet points, we want to give you an update on what we've been working on for when the Closed Beta starts. We have already told you of our experience at gamescom 2015. We were very happy and proud to learn that Albion Online received mmogames.com's award for the „Best Indie MMO at gamescom 2015“. Thanks to the mmogames team for visiting at our gamescom booth and the awesome award! The first new feature we want to tell you about are what we call shrines. Shrines are open world crafting stations and will be crucial in crafting enchanted gear in the future. They will come in three different sizes (small, medium, large) and three different colors (red, green and blue). The color determines whether that shrine is used for offensive, defensive or support items and the size has an influence on the maximum item level you will be able to craft. Did we mention that the larger shrines will be heavily guarded? You better bring some support. The second new thing we want to show you are treasure chests. Those treasure chests are placed all around the world and also come in three different sizes called locker, chest, and coffer. The bigger the treasure, the more dangerous it will be to get to, with the largest ones being placed inside castles. Once a chest has been looted, it will be put on a cooldown. This cooldown can be seen from the world map, so you will know when to prepare to fight for them. Expect heavy resistance from other loot hunters who will also try to secure their contents: relics needed for high tier crafting and silver.